This weekend over 10,000 people came to the village of Littleborough, which is where I happen to call home when I’m not travelling, to watch the largest free sport event on the planet as it passed through this small section of Greater Manchester. This was something I could not miss out on! Yorkshire has been in the news for weeks about how it was hosting stages 1 and 2 of the Tour De France, but what many people don’t realise is that for around 600m it passed through the county of Greater Manchester and into the outskirts of the beautiful village of Littleborough. It just so happens that we live in Littleborough and this was all anyone in the area was talking about! It felt like everyone in Greater Manchester wanted to come up and show support to this great event and truly felt like a once in a life time thing to happen to our village. Blackstone Edge reservoir in Littleborough where the race was to pass. I really was quite proud of Littleborough and it was amazing to see so many people up here on a stretch of road which is in all honesty is in the middle of nowhere. Even on the TV and online they mentioned how many people were squeezed into this small section of our county! It was also strange to see so many people in our usually quite sleepy village and great that they could come up here and enjoy such a great event and also see how beautiful this area is. Sometimes I am guilty of overlooking or taking for granted my hometown in search of exotic adventures, but this really made me appreciate it! What was cool is that we walked all the way from our front door and up to Blackstone Edge reservoir to watch the race. However that is in fact a 3.6 mile walk up hill, but being seasoned (ish) mountain climbers we got up to the corner in around 50 minutes. It was roughly 10:20 when we arrived and even then it was packed. We decided to give the corner a miss and walk a little further along to make sure we got a roadside spot. We enjoyed ourselves, even if we did get a little crisp! Although it was 12.00pm by the time the caravan came past and 2.00pm for the riders the day went really fast. The atmosphere up there was like a festival and everyone was having a laugh, even the police! So finally appeared the caravan, and for those who don’t know, this is a procession of floats and vehicles which precede the riders advertising all the main sponsors and throwing out freebies to the crowd! What I really loved about this though was how much it made you feel a part of this event. It also felt at times like we actually were in France! The Gendarmerie were whizzing past with their signature sirens blazing, along with traditional French accordion music, people shouting ‘Bonjour!’ and ‘Merci’ as well as all the announcements being made in French which really added to atmosphere. I managed to grab one of those polka dot cycling hats too, I’ve always wanted one of those!! Shorty seemed keen to model it for me! There were some interesting and rather wacky floats going past, many of whom I had never heard of as well as some comical additions such as Yorkshire tea and McCain chips! Finally the news filtered through the crowd that the riders were approaching and everyone edged closer and closer into the road! The helicopters circling above got closer and closer and finally the lead group came past in a flash! These guys were really going for it! Now for the force of the Peloton. Nothing really prepares you for the speed and intensity of the Peloton. It all looks so different on television, but they do truly roar past at some pace and create a huge back draft. I had my camera on as quickest shutter speed as I could get away with and used the burst feature to try and capture them! It is crazy too how close they get to you, it’s almost scary really, I am surprised more accidents don’t happen but its refreshing to see an event like this not needing a heavy handed security approach and that closeness really makes you feel a part of it. There is always on straggler! Getting back down in the Littleborough was a crowded affair! I have often watched the Tour De France on the television before and thought people must be crazy to wait all day for the riders to go past in the blink of an eye, but how wrong I was! This is one of those things you really need to see and experience to truly understand, to be part of such a great event is an honour. What makes the TDF so special is the crowds, the people and the support all the way along the route and I am pleased to say we were part of that and Britain and especially the north did itself proud! Tour De France Facebook Album! 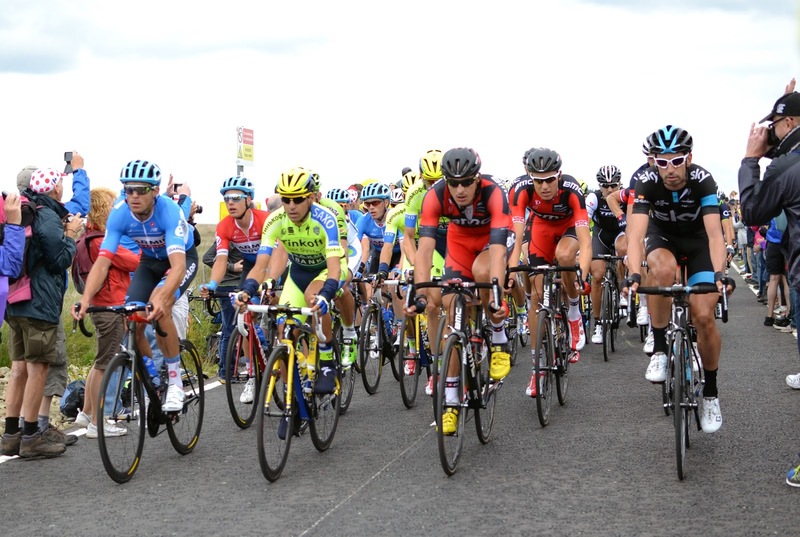 Bookmark this article Le Tour De France Comes To My Village! !